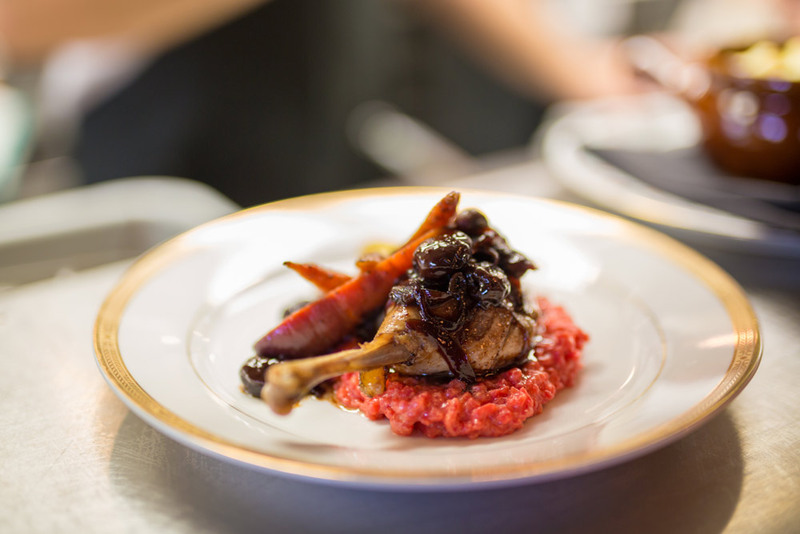 An elevated take on rustic French-Canadian favourites. Dinner is served Tuesday-Sunday. Please see our hours. Freshly baked Chartier sourdough with butter and salted herbs. Tempura fried green beans with smoked maple mayonnaise. Classic Quebecois poutine. Triple cooked handcut french fries, cheese curds, Montreal gravy. Magic. Pickled red onion and cucumber, thyme mustard, fried capers, herbed crostini and egg yolk. Caramelized onions, sourdough crouton,topped with melted cheese curd and gruyere. 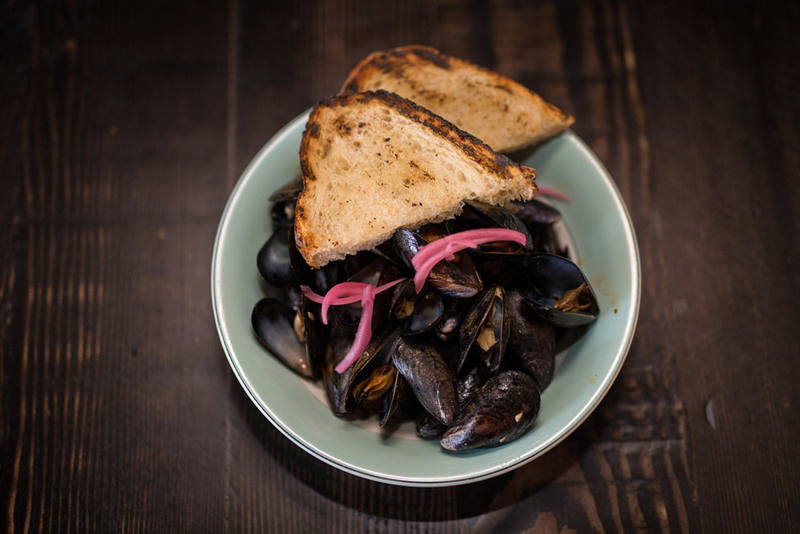 One pound of PEI mussels with house made andouille sausage, pickled onions, blue cheese and grilled sourdough. Arugula, chèvre vinaigrette, roasted carrot, pickled red onion, roasted garlic, toasted walnuts, confit lemon and balsamic reduction. A daily selection of meats, cheeses, and preserves. House smoked slow-cooked brisket, sourdough bread, thyme dijon. shallots and garlic with arugula, toasted walnuts and balsamic reduction. Chartier style meat pie with bison, pork, and confit duck. Served with brussels sprouts and house made rhubarb relish. Braised chuck, smashed pear, bacon roasted mushrooms, topped with cheese curd pomme purée. Baked Atlantic salmon, pea purée, brussels sprouts, and pomme purée, drizzled with truffle chili dressing. Roasted beef patty on sourdough garlic bread topped with caramelized onions, mushrooms,kettle cabbage and gravy. Served with potato confit and green pea salsa. Bear and Flower bone-in pork chop with chow chow, lentils and beet pickled egg. Smoked City Life Farms steak, red wine reduction, tempura fried garlic pomme purée and braised cabbage. One lb lobster sautéed in garlic and butter, topped with poutine and lobster bisque. A rotating line up of 3 whimsical & creative burgers, made with fresh, grass finished & hormone free beef from Pine Haven Meat Shop served on our house made brioche buns. Fresh cod fried in a light, gluten free beer batter served with house-made coleslaw, tartar sauce, and triple cooked hand cut fries. Join us every Tuesday thru Friday from 4pm-6pm for happy hour, featuring $4 craft beer, $6 house wine, and FREE CHEESE.